This world is not our destination; it is our journey! There are many things here that can distract us from our goal and destroy our desire to complete our journey. 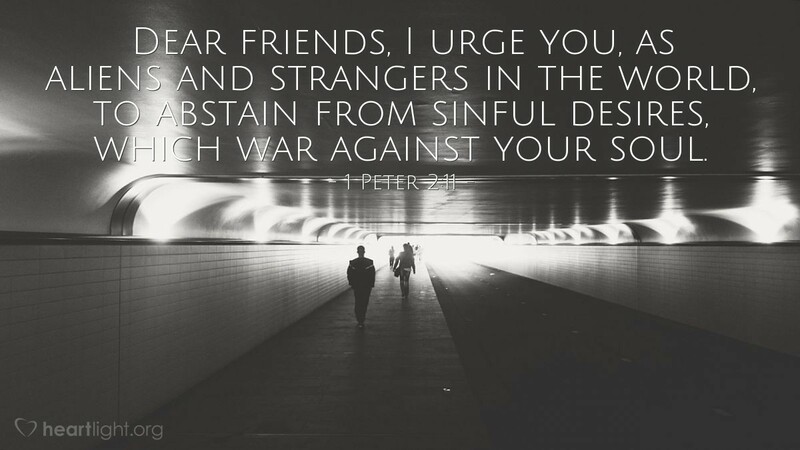 These sinful desires actually are at war with us. But through the power of the Holy Spirit, we can say "NO!" and live with confidence and character before our world that is trapped in darkness and so desperately needs God's light. Forgive me, holy God, for my failure with sin. Empower me, almighty God, so that I may grow ever closer to your character and holiness. Help me, loving God, to live a holy life that is attractive to my friends, family, and neighbors, so they may come to glorify you by living your life, too. In Jesus' name I pray. Amen.